This is the fourth post in a series titled “100% sustainable – is it possible?”. I hope you enjoy my analysis of different lifestyles, their ecological impact, and the possibility of humanity achieving sustainability. Houses cost a lot of money. These days, more and more people are still mortgaged when they reach retirement age. Meanwhile, young people struggle to find affordable housing to give them a start in life. I’ve been researching Tiny Houses, and one form of tiny house – the shipping container – might hold solutions to both problems. 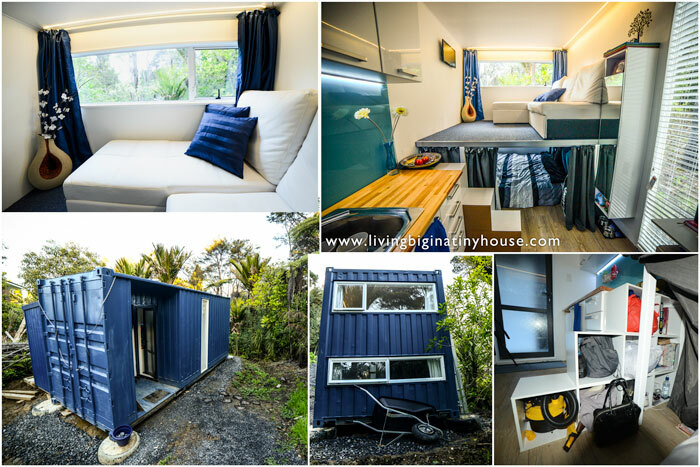 Where I live (in southern New Zealand), you can buy an unfitted out shipping container for about $5000. By comparison, the average house price in our town is about $260,000. So – what if, instead of buying the huge house and extra bedrooms for your older children, you buy a shipping container, slap it in your driveway, fit it out with all the modern conveniences, and use it as extra housing for your kids. In other words, why not do the small home plus shipping container option instead of the huge family home option? It’s not as grim as it sounds. I know I know, you’re hearing “shipping container” and imaging “third world slum”. Better yet, your teenage child can take their home with them when they leave home, setting them up with a home and saving you from having to sell up because your home is now too big! I think the time has come to rethink sustainable living, and consider alternatives to standard family living. Containers – and tiny houses – can have their own plumbing, electricity supply, and heating and cooling. They are safe and secure, and are even more earthquake-resistant that most traditional housing. I think choosing a tiny home for our kids to take with them is a generous thing to do. It’s also responsible. That reminds me of my old college dorm. It’s so cute! I think it’s probably valid. However, there are a LOT of secondhand shipping containers available, and a lot of secondhand windows available (the girl in the video I posted used secondhand container and windows for her home). Using secondhand materials probably makes a significant difference to the footprint of a home, no matter what materials you choose to use. Choosing the most sustainable alternative is never clear cut – unless it’s a secondhand tent! We’re always going to have an impact. But I do think that having a tiny home, no matter what it’s made of, is likely to lower our impact all over simply because we can’t fit as much junk in the home. So it forces us to choose our belongings more carefully, and eliminates the possibility of being a clutterbug.